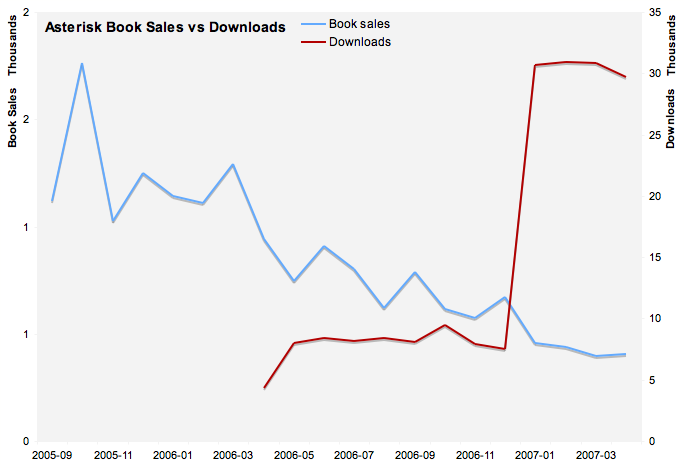 Do e-Books Mean More or Less p-Book Sales? Ever since the e-book made its debut in the 1990’s, there has been speculation about whether and how it would affect print book sales. There are annecdotal examples, but no systematic measurements that would give a clear indication of their impact. Recently, Tim O’Reily reported the results of an experiment comparing free downloads of a popular technical book with sales of the print version (see graph at right). What the experiment revealed is that free downloads had no apparent affect on print sales, positive or negative. This would be a useful practice to adopt for publishers who are offering both e-book and print book (p-book) versions of titles. One factor that makes it difficult to measure how e-book sales impact p-book sales is that there is no industry accepted pricing model for e-books. There is a perception that consumer expect e-books to cost substantially less than p-books – say $5 or less. Back in 2001, Foreward magazine, highlighted comments by M. Rose (of Wired magazine) about some niche audience Internet electronic publishing success stories. She pointed out the strong monthly download volumes achieved by three publishers charging in the $4-$7 range for their offerings. Unlike consumers, however, publishers have priced more on the value of the content rather than the costs of the media used to deliver it. An example of this emerged during a panel discussion on e-books recently reported on Palimpsest. A panelist from Simon & Schuster indicated a book priced at $25 hardcover generally results in an e-book price of $16.99, (comparable to paperback pricing. The question is becoming more important because of initiatives like Google Book Search. In January Google revealed more about its long term plans for Book Search. The company indicated it wants to not only let users find and preview books online, but also to sell access to scanned copies that can be read over the Internet or via portable devices. This brings up the inevitable comparison with Apple’s iTunes. It’s not certain that e-books will ever have the same universal appeal that digital music has achieved. Reading requires more cognitive horsepower than listening to music. The extra effort required to read digital books has to be rewarded with features that consumers perceive as value-added – e.g. an information reference that can be easily searched. Not all books will meet this criteria. e-books may ultimately turn out to be more like an adjunct to p-books, similar to audio books – useful in certain settings, but never reaching the mass market acceptance that p-books have achieved. The question may also become moot if electronic book technology moves away from special readers and onto the printed page itself – e.g. e-ink and digital paper. Stay tuned! This entry was posted in book marketing, publishing strategy. Bookmark the permalink. Google’s plan to sell access to scanned copies of books has enormous potential for areas that are geographically isolated. Here in Buenos Aires it is very difficult to find non-fiction English language books, particularly historical and scholarly works. (And not much non-fiction exists in the English to Spanish translation market). Even ordering through Amazon is a hit-or-miss, takes weeks for delivery and ultimately may never arrive due to the inefficiency of the Argentine mail service. I would gladly pay for online access to many works of non-fiction. Indeed, this has significant potential to enhance higher education through out the world. It’s so easy to forget that many parts of the world, even major, cosmopolitan cities, just do not have adequate libraries or access to quality printed books in English. Those are great points. In addition to Google, there are several large projects underway to make textbooks available in digital form for educational purposes. Heya i am for the primary time here. I found this board and I in finding It truly useful & it helped me out much. I hope to offer one thing back and aid others like you aided me.